6 nights / amazing 6 days North Vietnam Motorbiking. Night 1: Hanoi – Lao Cai By Train. We take the night train around 9pm. However, to send the bikes they require us to be present about two hours before. Day 1: Lao Cai – Luc Yen – Vu Linh. ~180 km, ~6 h.
Today is the first day of this amazing 6 days North Vietnam Motorbiking. Before starting to ride, we will have a short briefing to let you know about the rules. In addition, the guide will show you how to understand him by his body language. We start around 9.30am after the rush hours. We pick up the bikes, start from Lao Cai train station and ride to Luc Yen. 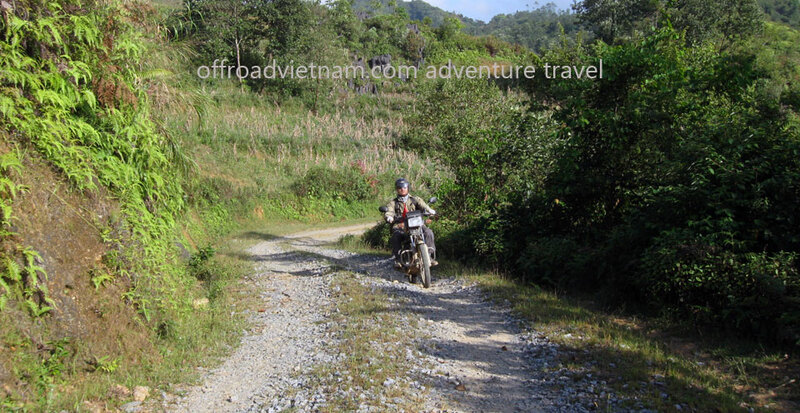 Then you follow a small track to Vu Linh in about 2 hours through palm trees and scenic mountain views. It will be dark already. The welcome is exceptional and we hope you will not be too much tired. Day 2: Vu Linh – Thai Nguyen – Bac Kan. ~230 km, ~9 h.
You ride from Vu Linh to Ba Be. There are two roads: the easiest through Thai Nguyen is over 200 km, the other one is much shorter but quite difficult. The last 50 km, you follow the river and end by a waterfall, which means that the road suddenly goes up as high as the waterfall. Then you find yourself in Mr. Pirate’s House at the top of Dau Dang waterfall. It is adventurous but very tough, the other option, the long road, is safer, and if you feel tired you can stop in Bac Kan or in Cho Don. You still have a full day on Monday to enjoy the lake. Day 3: Bac Can – Ba Be. ~60 km, ~2 h.
If you arrive early enough, there is a very cute market 3 km before to reach the lake. Our friends wait for you there, you go to the other side of the lake with the bike on it (only 15 minutes) then you cross all the lake (~7 km), join the river that you follow to the waterfall. There is Pirate’s House where you have lunch and a good rest. In the evening, you go back the same way and have dinner in the captain’s house Mr. Dang (We call him Zi Dang). You sleep there as well. Mornings are beautiful. Nice and easy drive to the province of Cao Bang (~170 km) with some very nice spots at the top of the passes. You have about 20 km off road (easy) and all the rest is asphalted. Our friend will welcome you in the Host House of Quang Uyen. Good food. Day 5: Quang Hoa. ~30 km, ~1 h.
Picnic? A small ride and then rafting down the river and an easy walk to the waterfalls. We propose you to discover the wonder of Na Tau. Easy and funny day. Day 6: Quang Hoa – Hanoi. ~300 km, ~9 h.
You will ride through the jungle for a while, and then join the RC 4 Road until Lang Son . Then we use Highway 1B back to Hanoi. Contact us now to book this tour or to know about different itineraries and options of this amazing 6 days North Vietnam Motorbiking. The video below has some portions of this 9 days Vietnam Northwest motorcycle tour. In case you want to watch more videos of our Vietnam motorbike tours please check our YouTube channel.